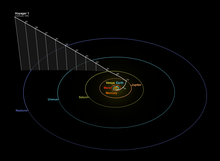 Diagram of the Voyager 1 Family Portrait. The Family Portrait, or sometimes Portrait of the Planets, is an image of the Solar System acquired by Voyager 1 on February 14, 1990 from a distance of approximately 6 billion kilometers from Earth. It features individual frames of six planets and a partial background indicating their relative positions. The picture is a mosaic of 60 individual frames. The frames used to compose the image were the last photographs taken by either Voyager spacecraft (which continued to relay other telemetry afterward). These frames were also the source of the famous Pale Blue Dot image of the Earth. Astronomer Carl Sagan, who was part of the Voyager imaging team, campaigned for many years to have the pictures taken. The view photographed by Voyager 1, as rendered using Celestia. Six planets are visible in the mosaic, from left to right: Jupiter, Earth, Venus, Saturn, Uranus, Neptune. The Sun, also a point of light at this distance, is included in the image. Mercury was too close to the Sun to be seen, Mars could not be detected by the Voyager cameras due to light from the Sun behind it scattering in the optics, and Pluto (which in 1990 was still considered a planet) was not included because its small size and distance from the Sun left it too dim to image. The image does not have a unified appearance. The individual frames were acquired using various filters at varying exposures to bring out as much detail as possible in each. For example, the Sun was imaged with the darkest filter and shortest exposure available, to avoid damaging the Imaging Science System vidicon tubes. The majority of the frames were acquired in gray scale with the probe's Wide-Angle Camera, while the close-up views of each planet were acquired in color using the Narrow-Angle Camera. The image was acquired at a distance of approximately 40.11 AU from Earth and approximately 32° above the ecliptic plane. Of the two Voyager spacecraft, Voyager 1 was chosen to create the mosaic because its trajectory had taken it above the plane of the Solar System, and unlike Voyager 2, was in a position to view Jupiter free of light disturbances by the Sun's glare. In 2013, a reverse image was taken of Voyager 1, using radio telescopes. Voyager 1 cannot be seen in visible light, but its radio signal is very bright compared to most natural things studied by radio telescopes. ^ Planetary.org. "Planetary.org". Retrieved March 23, 2014. ^ JPL. "Photojournal". Photojournal. Retrieved March 23, 2014. ^ astrobio.net. "astrobio.net". Retrieved March 23, 2014. ^ Gannon, Megan (September 14, 2013). "Pale Blue Dot 2: Voyager 1 Signal from Interstellar Space Seen from Earth". Space.com. Retrieved 2015-02-02.